Leonardo DiCaprio presents 'The 11th Hour' a documentary on the state of the natural environment and our relationship with Planet Earth. While we might think of ourselves as separate biological life forms living on a planet which feeds us, nourishes us, gives us all that we have, the emerging truth is that we are one with all that is ... we are nature ... we are the earth ... we are in fact one with the Brahman, the cosmos ... The Cosmos is Consciousness ... and we are that one cosmic consciousness experiencing itself subjectively ! This knowledge originates from the ancient vedic texts of India. 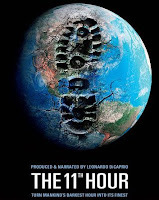 With contributions from over 50 politicians, scientists, and environmental activists, including former Soviet leader Mikhail Gorbachev, physicist Stephen Hawking, Nobel Prize winner Wangari Maathai, and journalist Paul Hawken, The 11th Hour documents the grave problems facing the planet's life systems. Global warming, deforestation, mass species extinction, and depletion of the oceans' habitats are all addressed. The film's premise is that the future of humanity is in jeopardy unless we change our destructive ways and learn to live one with nature, in harmony with all existence.